Have you invested in ducted heating and cluttered your roof space with so many ducts and pipes that it would seem to be impractical to install a decent cooler? Fortunately, you can rely on add-on air conditioning to keep you comfortable. Add-on air conditioning is refrigerated cooling that uses the same ductwork and outlets as your ducted heater. Make the most of your existing duct infrastructure by filtering cooled, dehumidified air when you are not using your heater. 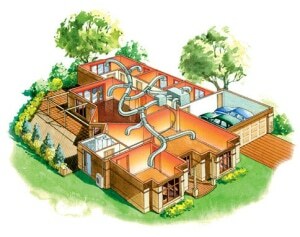 Air from inside the house is drawn and filtered through a return air grille which then passes through an indoor cooling coil where the heat in the air is transferred to the refrigerant. The cooled and dehumidified air passes through the ductwork and into the rooms via the ceiling or floor vents. The heat given off by the air passing through the indoor coil is carried by the refrigerant to an outdoor unit where it dissipates outside. Are you concerned about excessive operational costs as a result of inefficient climate control in Melbourne? Consider the number of outlets throughout your office or home and determine how many are actually needed at any given time. There is no point spending energy and money on regulating the temperature of empty rooms. Alternatively, you may need to treat each room differently to accommodate for everyone’s personal preferences. Also, some rooms may naturally be too warm or too cold and need to be treated accordingly. To optimise airflow efficiency we recommend that you invest in temperature zoning. Generally, it is a good idea to incorporate zoning capabilities when you initially install an air conditioning system so that you can immediately benefit from this cost-effective technology by saving money and resources. If you would like to determine whether add-on air conditioning and system zoning is compatible with your current setup get in touch.